An unknown number of copies exist with the A label applied to both sides in error. Track A recorded at Henry's Studio, West Kirby, Liverpool. Track B recorded at Cargo Studios, Rochdale; Mixed at Strawberry Studios, Stockport. Edition of 5000, sold out by September 1979. Housed in black on black thermographic sleeve and printed and hand folded and glued by John Roberts and Sons Printers, Chapel Street, Salford. "Record now licensed to Dindisc, Virgin's new label; to engage in the chart game as of Sep 28th '79. Necessity for licensing 'the best example of this to date' (NME) is regretted but the big stall holders seem to fill the square (chart shops) and subletting is an enforced activity." 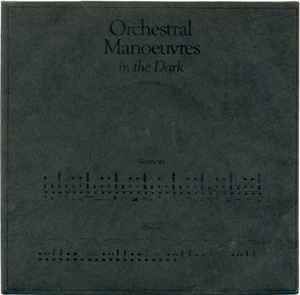 In 1980 a 3rd version of the 7" was issued (DinDisc DIN 2 - "A Factory Records Product") with both tracks now produced by OMD and Chester Valentino in the versions found on OMD's debut LP.